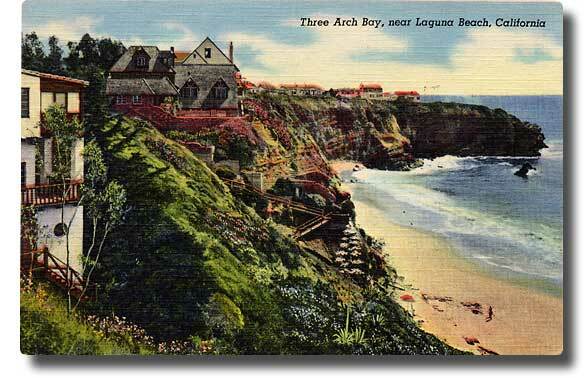 you enjoy old postcards of Three Arch Bay! This unusual oval framed image was taken from the rocks of Three Arch Bay, looking south toward Dana Point in the distance. 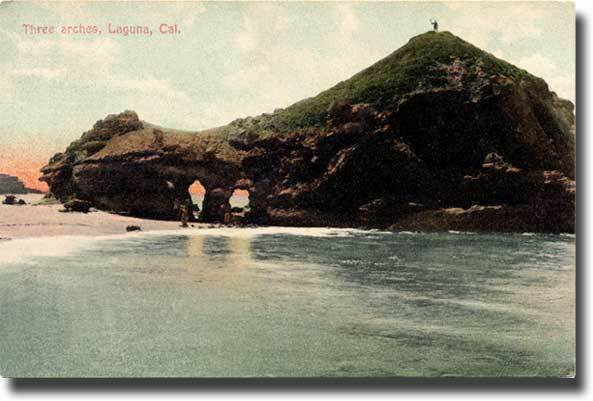 It has a Laguna Beach postmark of April 15, 1907. This postcard shows a lot of hand-painted vegatation where there isn't any! The photo was probably taken by the same photographer that took the photo below, as the same man is waving from the island, and the same family can be seen in the arches. The undivided back of the card indicates that it is pre-1907. "About three miles from our house. We often have picnics here. Susie"
As you can see, Whale Island has changed very little over the past one hundred years, but the fashion of the beach goers in front of the arches sure has. And as always, there's invariably some fool climbing to the top today too. Is that Cousin Lester up there? At one time in the late 1920's, Cecil B. DeMille planned to purchase Whale Island and build a castle on top, but this plan thankfully fell through. 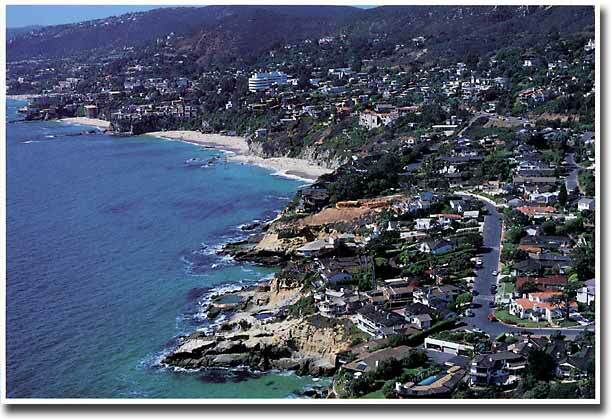 But again in 1965, Dr. Ervin Watkins, a Laguna Beach dentist, had plans drawn up to build four homes on top of Whale Island. 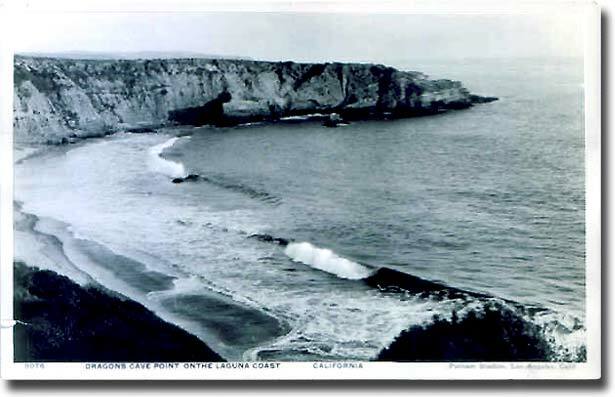 The plans called for removing the top 14 feet of the island, with the earth being dumped over the West and North sides to create a private beach. A driveway and bridge running alongside the present ramp to the beach would cross over to the island. The owner of the island at that time, Verine Cole, listened to the many objections of the residents of Three Arch Bay, and reluctantly but thankfully decided not to go through with the project, but I worry that this idiocy may actually be entertained again by some future owner of Whale Island. This must never happen! This card is postmarked in 1908, yet I believe the photo was taken many years earlier. I am currently researching this matter through investigation of records of the Newman Post Card Co., and hope to arrive at a more correct date for this picture eventually. You can try to read the back of the card if you want - Good Luck! 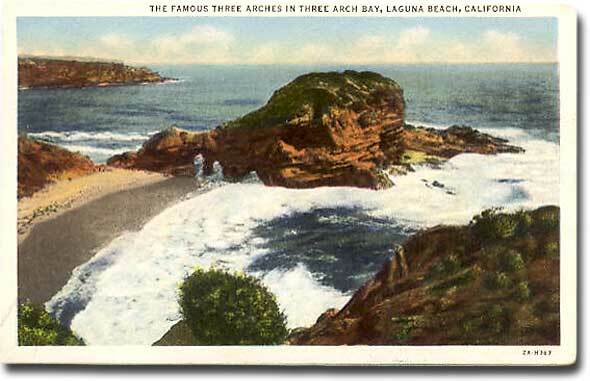 This misnamed postcard nearly missed my eye, but on taking a second glance, I realized that it was Three Arch Bay. The date is a rough guess based on the publishers name and the configuration on the back which narrows it down to between 1910 and 1925. 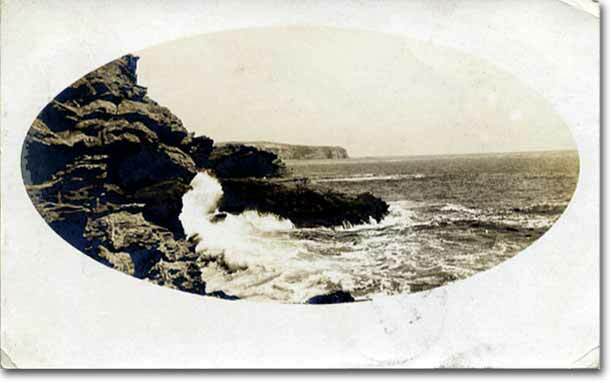 Since there is nothing to be seen on the cliffs above, it must be before 1920. I don't know where they came up with "Dragons Cave", but the shadow on the cliff cast from the rock near the center may have been the inspiration. I have the same view on this photographic postcard in a huge full-sized version. There is no postmark on the back, but the date would be sometime between 1920 and 1924. You can see that most of the roads of Three Arch Bay housing tract have yet to laid out. See some amazing close-ups of this photograph. 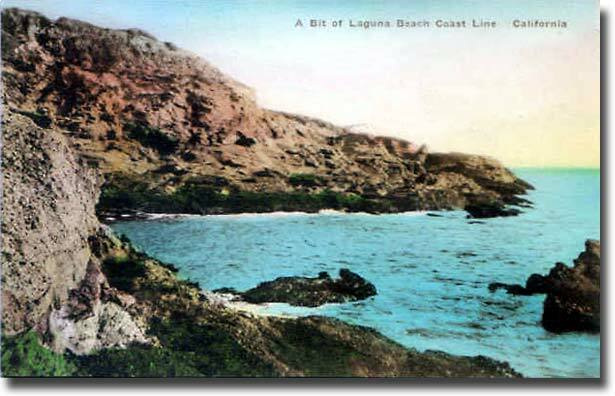 I've matched up the location of this hand-tinted postcard from the early 1920's to the rocks at the extreme north end of the Three Arch Bay community. The picture was taken from the rocks on the north side of Picture Bay looking south. Although I am unsure of the date, because the card is unused and there is no date anywhere else to be found, I have seen others from this same series and printer and they all have postmarks from 1927 onward. The lack of homes on the far cliffs also seems to verify this assumed date. Either way, It looks great! 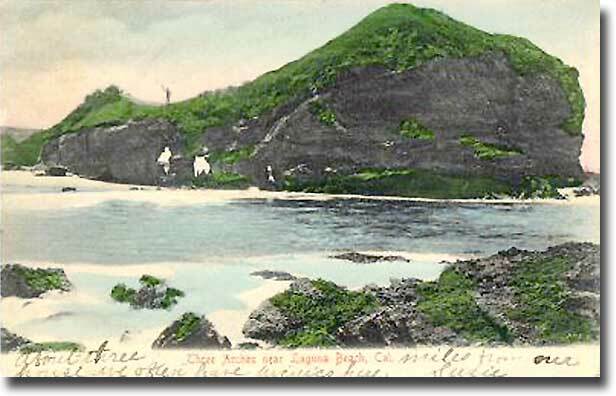 This linen postcard mailed in 1932 shows the famous "lighthouse" overlooking one of the smaller coves at the north end of Three Arch Bay. The lighthouse is not an actual navigation device, but a part of the home, built by Hollywood Director / Producer Edward H. Griffith, just out of view to the left. The lighthouse is quite a large structure, over four stories high. A ladder is used to gain entrance to each higher floor, through a trapdoor that is lockable from above, until one reaches the very top - a secluded reading library. Mr. Griffith sure loved his privacy! 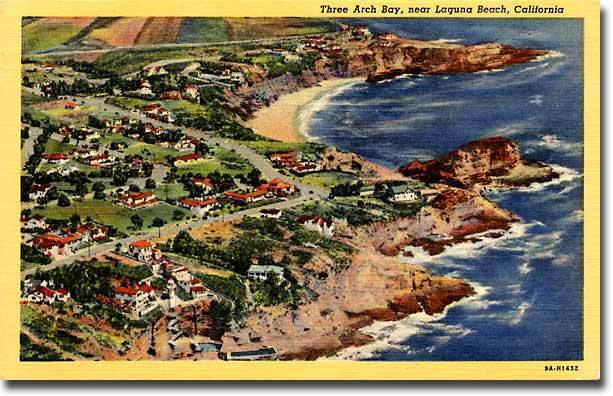 An unusual aerial view of Three Arch Bay on this beautiful linen postcard shows how much open space there was not too long ago. I believe this was taken around 1932, but I have yet to confirm that date. 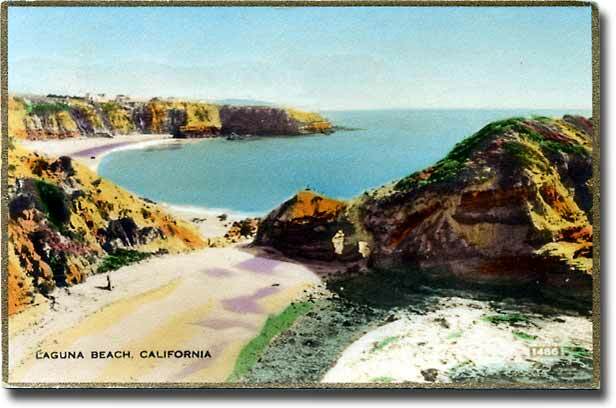 A hand-tinted photographic postcard sent by Dora Hill, one of the first residents of Three Arch Bay, to her friend "Mrs. Bonnelli" in Wasco California. Read the back of the card here. 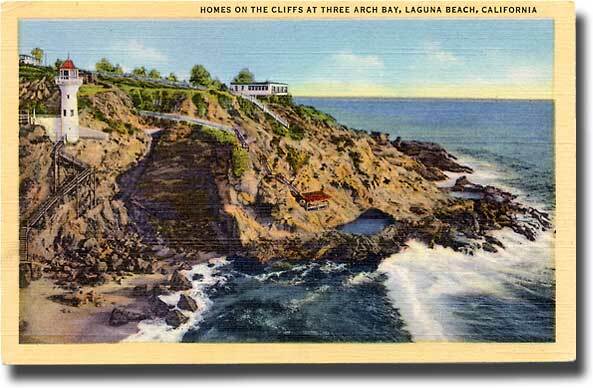 Although postmarked in 1935, because of the scarcity of visible homes on the far cliffs it appears as though the picture comes from an earlier time, possibly the mid-1920's. Little has changed in the 55 years since this beautiful linen postcard was mailed in 1947... A few more homes out on the far point today, but otherwise it looks the same now as then. The English style brick mansion in the center, called Cliff Coté, shows almost no change at all. It's twisted brick and wood stairs still being one of the community's main accessways to the sand. The home was built in 1933 by General Proctor out of used brick gathered in the wake of the devastating great Long Beach earthquake of 1933. General Proctor had stayed in a similar house in France during WW1, and became enamored of it's style and charm. From the cliffs at the south end of the beach looking north toward Whale Island, with the waves smashing against Bird Rock in the foreground and the hills of Emerald Bay in the far distance. I would guess that this looks like a typical winter day, when the beach is empty, the skies are brilliant blue, and the waves come from the north, caused by powerful storms in the Bering Sea. My favorite time of year! Taken from almost the same angle as the card above, with almost the same weather, and amazingly enough, almost the same wave crashing against Bird Rock! 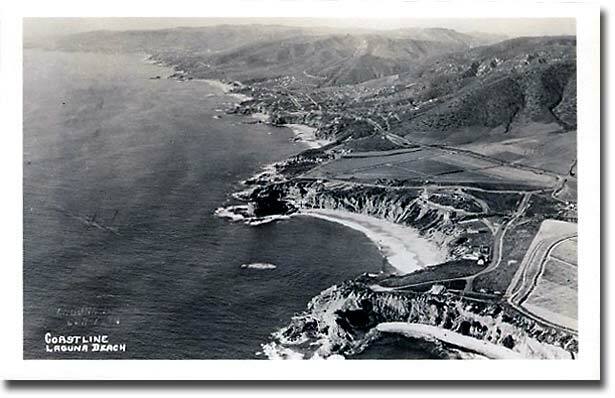 An aerial view postcard taken above Aliso Beach looking south toward Three Arch Bay, with Dana Point in the far distance. 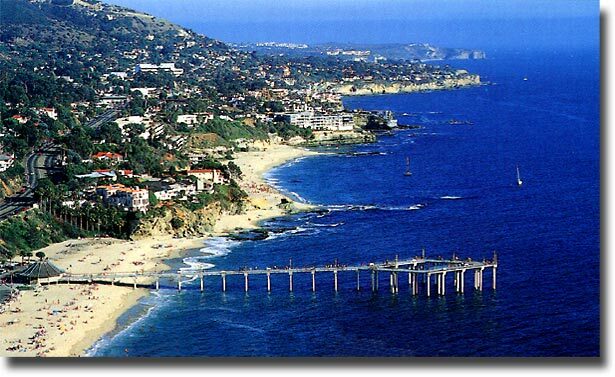 In the foreground is the now vanished Aliso Beach Pier - and I say "Good Riddance!". The 600ft. 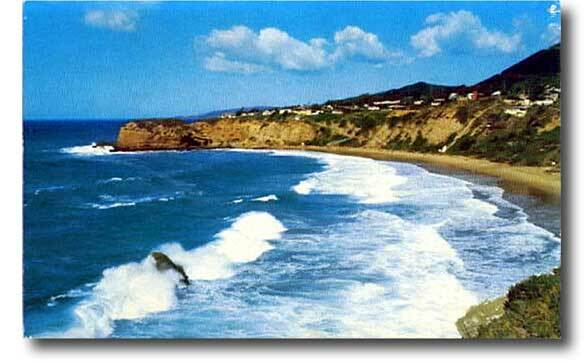 pier was built in 1971 by an arrogant and misguided Orange County Board of Supervisors at a cost of $670,000. The huge surf from the El Niño storms of 1983 and 1986 damaged the pier extensively. It was refurbished at a cost of 1.2 million dollars, but again, the monster 25ft. waves from the storms of 1997 finished off this eyesore for good by damaging almost 1/2 of the 35ft. high concrete pilings...Yeah storms!. 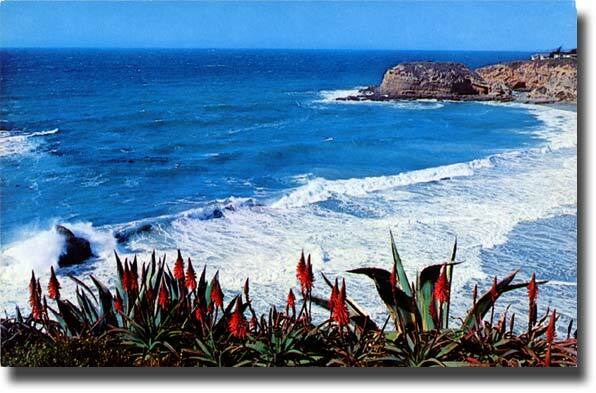 It was finally removed completely in 1999, allowing our beautiful coast to regain it's dignity. Recycled concrete from this monstrosity went into the construction of the pools and handrails of the Orange County Zoo's "Coastal Cove" exhibit. Although I'm against the inhumane capture and display of our gentle neighbors in the sea, and protest this exhibit, at least some small measure of good was made from this horrible and unwanted blight upon our coast. A great photographic postcard, eh? I like this one! An aerial view above Three Arch Bay awkwardly looking toward the north. Ackk! 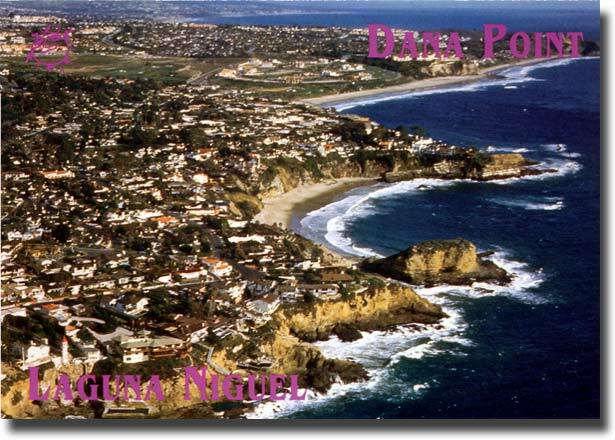 How completely lame and unprofessional for this company to release this newest and wonderful postcard of Three Arch Bay and then labeling it as "Dana Point", and even worse, "Laguna Niguel". It made me sick to see this travesty. Hope you liked the little tour. 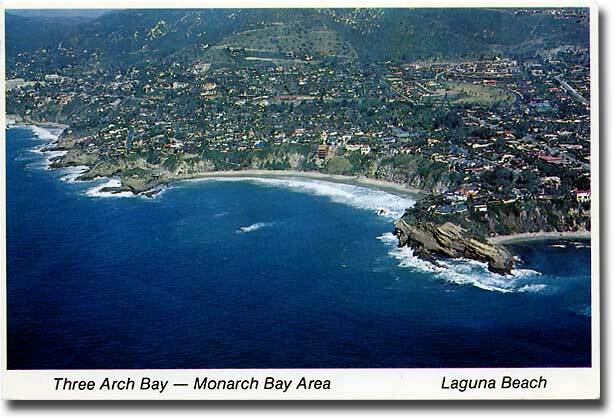 See the complete history of Three Arch Bay! And don't forget to see my new section of Historical Photos of the South Coast!